On Wings of Eagles: He will take care of us. Summer 2011/2012 in the Southern hemisphere was greeted by heavy flooding in the Bay of Plenty, New Zealand. Some areas received 15 ½ inches of rain, more than what they received in any given month, in just 48 hours. The rain persisted as if it had no end. It flooded State Highway 2, as well as numerous other roads in the region. Warning signs were placed on every road implicated in the flooding, hoping to deter disaster for anyone who was unaware of the possible dangers. One couple drove right by those menacing warnings. They thought they were in control, and nothing could stop them. Once near Whakatane however, their vehicle was swept away by the current. As it happened, the passenger lowered her window just in time. It was a gesture that would save them. With difficulty, they were able to swim to the bank, where they remained, shivering with cold, until authorities could come to their rescue. Not only had they lost they vehicle, they also faced the wrath of authorities for putting their lives, as well as the lives of those who were implicated in the rescue operation, at risk. Too late they realized that truly no human can be in complete control. Jesus was tempted in the same way, though He never fell into temptation: "If you are the Son of God, tell these stones to become bread." (Matt 4:3) It was again an urge from the evil one for Jesus to prove Himself by taking matters in His own hands. Silly, don't you think? But very efficient! Even today, most, if not all of us, fall for this same trick: We are tempted with issues of control and pride. Sin is not just disobedience and doubting God. It especially involves taking matters into our own hands with the goal of being in total control. We are in the driver's seat, and if you don't like our driving, you can get out! It's all about: Me, Me, ME!!! Sin cannot lead to the rest Jesus promised in Matthew 11:28, as there is no rest for the wicked. Worries increase as we try to remain in total control of the kingdom we have tried to establish, a realm that, though it may seem enormously important to us, is actually quite insignificant when compared to the vastness of the universe! Jesus came not only to save us from ourselves, but also to demonstrate that real living can only be obtained by leaving all of our control issues in God's hands. He is the One who knows best. He cares for us better than we can possible care for ourselves. He is the One we must leave in charge. With Him, we truly have nothing to worry about. 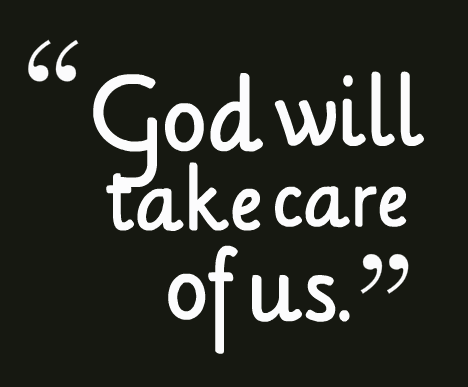 He will take care of us! Dear Lord, help us daily to leave all control to You. Help us relinquish all control to You. Thank You for being our guide in all things. In the Name of Jesus. Amen.